The Avalon Saigon launches in 2018 and offers cruises exploring the rivers of Asia. 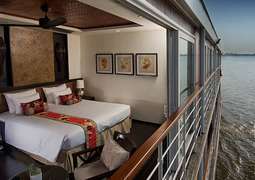 The ship is fitted with modern amenities such as air conditioning, a spa and much more. The Avalon Saigon features only Suites, built to meet your every need. Wall-to-wall panoramic windows allow you to gaze at your astounding surroundings at all times, while also allowing for a large balcony to be created. Spacious closets, a large private bathrooom with premium bath amenities and superb service, your stay is sure to be comfortable and indulgent. Dining onboard the Avalon Saigon features regional and western cuisine served in a spacious dining room designed to fit in with the areas you are discovering. Meals are prepared using fresh ingredients, and a live cooking station is also available to watch the Head Chef prepare local specialties. The 'Panorama Lounge' allows for socialising with fellow passengers, taking in the beautiful views and relaxing with a cold, refreshing drink prepared at the bar located in the lounge. The 'Observation Lounge' features lounge chairs and is perfect for getting some sun and watching the world pass by as you cruise along the river. Your stay is sure to be intimate and relaxing with all the features and space available onboard. A spa treatment room onboard allows for ultimate luxury and is perfect for relaxation after a day onshore. There is also a fitness center available, allowign for guests to get their blood pumping with a variety of equipment available.